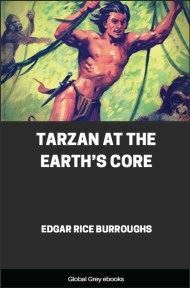 This is the seventh and final book in the Pellucidar Series. 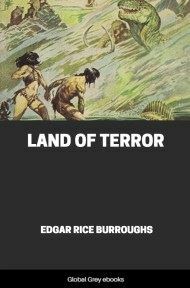 Like a number of other posthumously published books by Burroughs, this book is not a novel but a collection of short stories. When David Innes and Abner Perry set out to search for mineral deposits in Perry’s newly invented Mechanical Prospectro, they never dreamed of discovering the beautiful, terrifying world of Pellucidar five hundred miles beneath their feet. 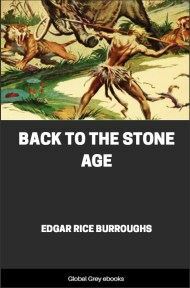 Cast into a country of fierce fighting men, beautiful women, and vicious beasts, David and Abner take sharply diverging paths. 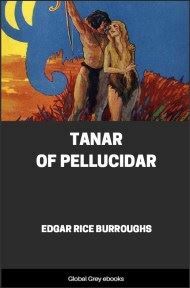 David and his mate, Dian the Beautiful, set out to teach Pellucidar the ways of civilization and succeed in gathering a number of primitive kingdoms into the Empire of Pellucidar. Meanwhile, Abner turns his inventive genius to the science of aeronautics, with dire results for both David and Dian. DAVE INNES came back to Sari. He may have been gone a week, or he may have been gone for years. It was still noon. But Perry had completed his aeroplane. He was very proud of it. He could scarcely wait to show it to Dave Innes. "Does it fly?" asked Innes. "Of course it flies," snapped Perry. "What good would an aeroplane be which did not fly." "None," replied Innes. "Have you flown it yet?" "No, of course not. 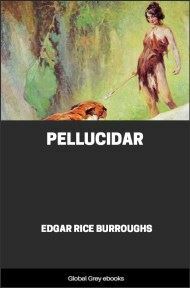 The day of the first flight is going to be epochal in the annals of Pellucidar. Do you think I'd fly it without you being here to see?" "That's mighty nice of you, Abner; and I appreciate it. When are you going to fly it?" "Right now, right now. Come and see it,"
"Just what do you propose using an aeroplane for?" asked Innes. "To drop bombs, of course, just think of the havoc it will raise! Think of these poor people who have never seen an aeroplane before running out from their caves as it circles overhead. Think of the vast stride it will be in civilizing these people! Why, we should be able to wipe out a village with a few bombs." "When I went back to the outer crust after the Great War that ended in 1918," said Innes, "I heard a lot about the use of aeroplanes in war; but I also heard about a weapon which causes far more suffering and death than bombs." "What was that?" demanded Perry, eagerly. "Ah, well," said Perry, "perhaps I shall put my mind to that later." Dave Innes grinned. He knew that there was not a kinder hearted person living than Abner Perry. He knew that Perry's plans for slaughter were purely academic. Perry was a theoretician, pure and simple. "All right," he said, "let's have a look at your plane." 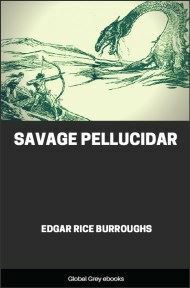 Perry led him to a small hangar—a strange anachronism in stone-age Pellucidar. "There!" he said, with pride. "There she is; the first aeroplane to fly the skies of Pellucidar." "Is that an aeroplane?" demanded Innes. "It certainly doesn't look like one." "That is because it utilizes some entirely new principles," explained Perry. "It looks more like a parachute with a motor and a cockpit on top of it." "Exactly!" said Perry. "You grasped the idea instantly yet there is more to it than the eye perceives. You see one of the dangers of flying is, naturally, that of falling; now, by designing a plane on the principles of a parachute, I have greatly minimized that danger." "But what keeps it in the air at all? What gets it up?" "Beneath the plane is a blower, operated by the engine. This blows a strong current of air constantly straight up from beneath the wing; and, of course, the air flow, while the ship is in motion supports it as is true in other, less advanced, designs; while the blower assists it in quickly attaining altitude." "Are you going to try to go up in that thing?" demanded Innes. "Why, no; I have been saving that honor for you. Think of it! 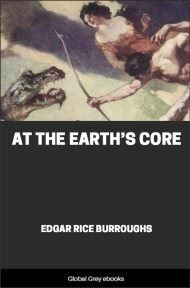 The first man to have flown in the heavens of Pellucidar. You should be grateful to me, David." Dave Innes had to smile; Perry was so naive about the whole thing. "Well," he said, "I don't want to disappoint you, Abner; and so I'll give the thing a trial—just to prove to you that it won't fly." "You'll be surprised," said Perry. "It will soar aloft like a lark on the wing." A considerable number of Sarians had gathered to inspect the plane and witness the flight. They were all skeptical, but not for the same reasons that David Innes was skeptical. They knew nothing about aeronautics, but they knew that man could not fly. Dian the Beautiful was among them. She is Dave Innes's mate.